The Wharncliffe Hybrid Flipper is an exquisite hand-made knife from Jason Clark. It features a smooth, contoured C-Tek Matrix front scale. If you're not familiar with C-Tek Matrix, it has aluminum mesh that is filled with an epoxy resin. It's a super cool material that is perfectly finished. The handle has a titanium framelock, liner and pocket clip. 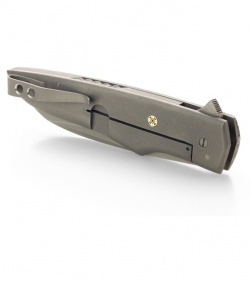 The backspacer is stainless steel with filework and tumble finished to match the framelock. 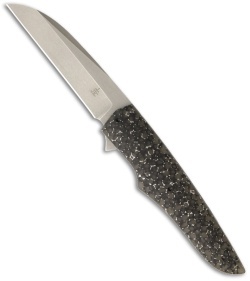 The Wharncliffe style blade is stonewashed N690 steel and glides open with ease thanks to the IKBS bearing system. This Jason Clark folder is an excellent choice for everyday carry and comes with a tip-up carry pocket clip.